...I know it's just not in the cards. SO, I have decided that instead of chucking out the current foyer table (its the right size AND I save some $$), why not give it new life with some fabric? It's actually a great idea and I can't believe I didn't think of it sooner. The fabric will help serve two purposes. The first being that it will hide any unsightly storage underneath the table (there's a shelf that can hold shoes when we have guests over - see photo below). 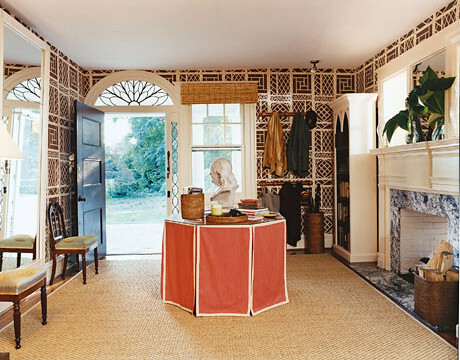 And the second purpose being it will add color and pattern to provide an impactful entrance into the house. 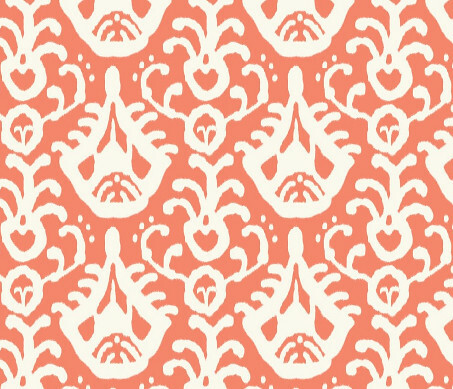 This of course is all dependent on the fabric that I choose, but if you couldn't already guess, I'm thinking of the Coral Ikat (1st image at the top) by Domesticate from Spoonflower. 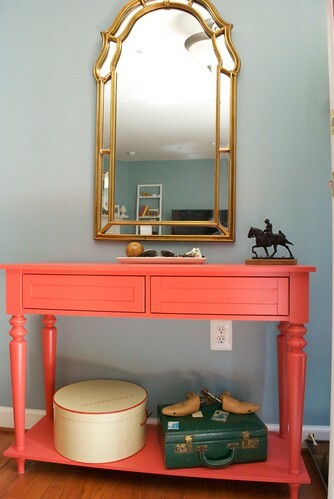 Even though I'm not in love with the foyer table, it's one redeeming quality is the coral color, which is why I'm gravitating towards a coral fabric with a fresh print. Once I get the Coral Ikat swatch in the mail, I'll document the process of taking the fabric and turning it into a skirt for my foyer table. Until then, check out the photos below for some great examples of skirted tables. 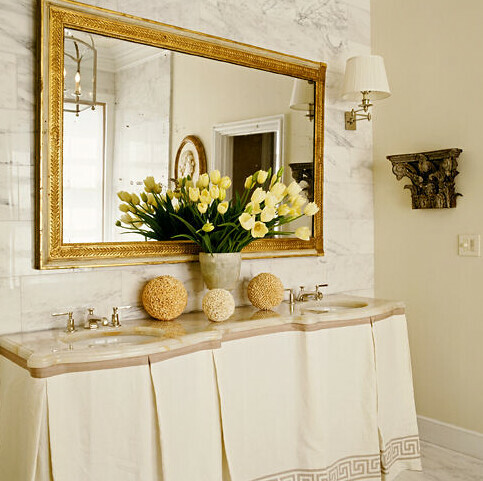 And my next post will feature a designer who inspired me to do this for my own home. Can you guess who? I love the boxed pleated ones, such a modern take on table skirts. Thanks for featuring my fabric!!! Can't wait to see if it will work out.